I hope that your weekend was wonderful- ours was jam packed with festivities as my younger brother Jonny got married. We had a big party at our house, hit the beer gardens before a Mariners Game and then I got to watch my brother get married to the woman of his dreams in the back yard of our childhood home. My dad officiated and it was in my mother’s garden- the whole thing was so incredibly sweet and we had a blast dancing late into the night. Monday was obviously spent lying around in jammies watching movies while we “recovered.” We watched all the oldies like Joe versus the Volcano, Dazed and Confused and a little National Lampoons action. Very mature and sophisticated film choices, huh? So Tuesday marks the end of Summer and the return to reality. Our schedule goes back to normal, the kids start back to school this week. It’s time, but I am not sure I’m ready!? But the kids are excited for school to start, so I have to get with the program. But I also realize (and worry) that I have to start packing lunches and making real dinners again (gahhh!!!!) 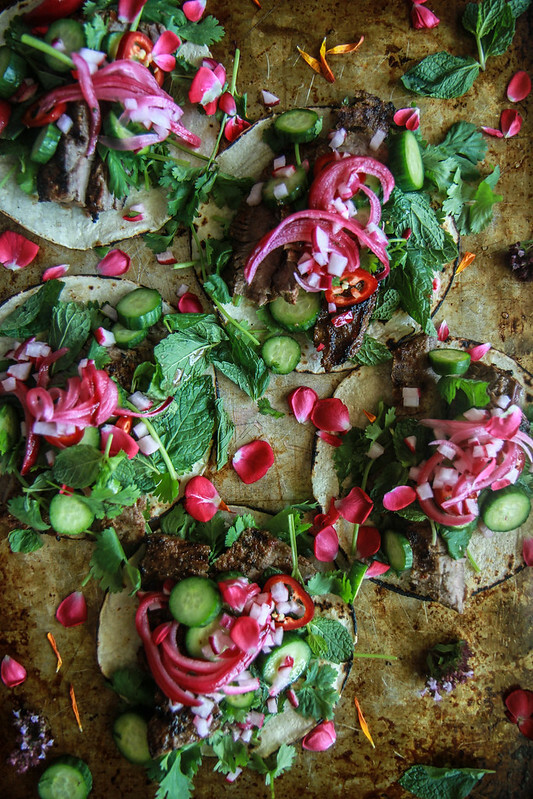 So today we are going to start with these awesome Lebanese Tacos. 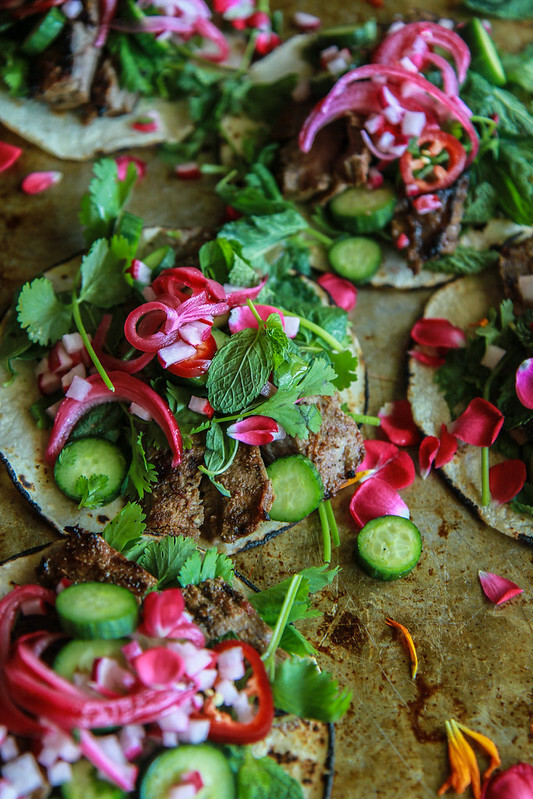 They are packed with Harissa marinated skirt steak and topped with the most delicious little salad of fresh herbs, Persian cucumbers and pickled onions. Not only are they so incredible flavorful, but they are also really pretty- try these for your next family dinner! In a large Ziploc add the steak, olive oil, red wine vinegar, garlic, Harissa, Cumin, ground coriander and kosher salt. Rub the steak with all of the ingredients to combine everything well and coat the steak. Refrigerate at least for a few hours and up to overnight. Preheat the grill to high. Grill the steak for 2-3 minutes on each side. With the lid down. Set the steak on a cutting board and let rest for 5 minutes while you prepare the other ingredients. Heat the tortillas over a gas flame or lightly grill on your BBQ until hot and slightly charred but flexible. 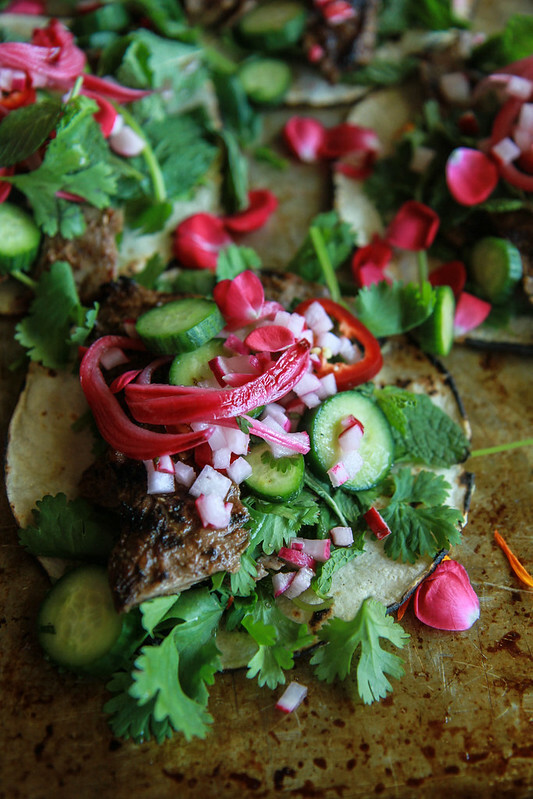 To put the Tacos together take a tortilla and pile some fresh cilantro and mint, steak and then top with Persian cucumbers, thinly sliced red fresno chili, diced radishes and sweet and spicy pickled red onions. Serve hot. Taco Tuesday sounds just perfect to me. I absolutely need to try these! This looks so pretty.. and I can never pass up a taco! These tacos look amazing! I can’t wait to try this recipe very soon! LOVE harissa! can’t wait to try this! These tacos are stunning Heather!